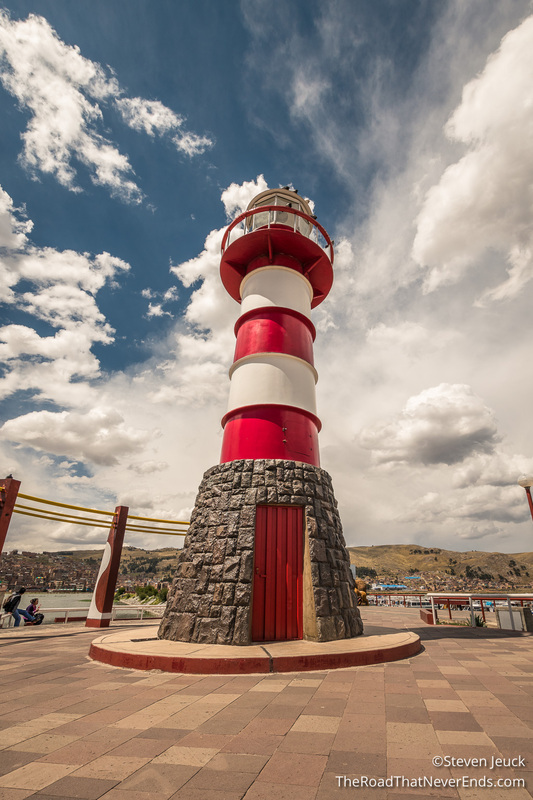 Puno is the 5th highest city in the world – at 12,500 feet – boy can we feel it! 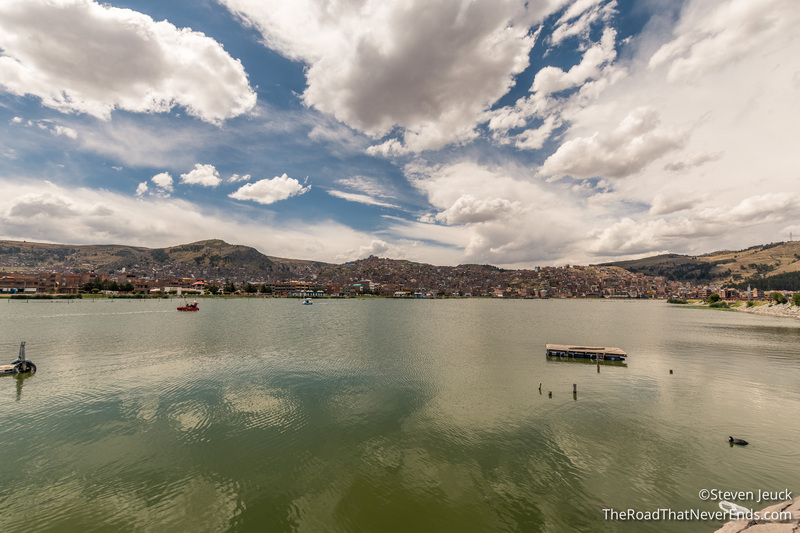 Puno is most known for being a populated city on Lake Titicaca. 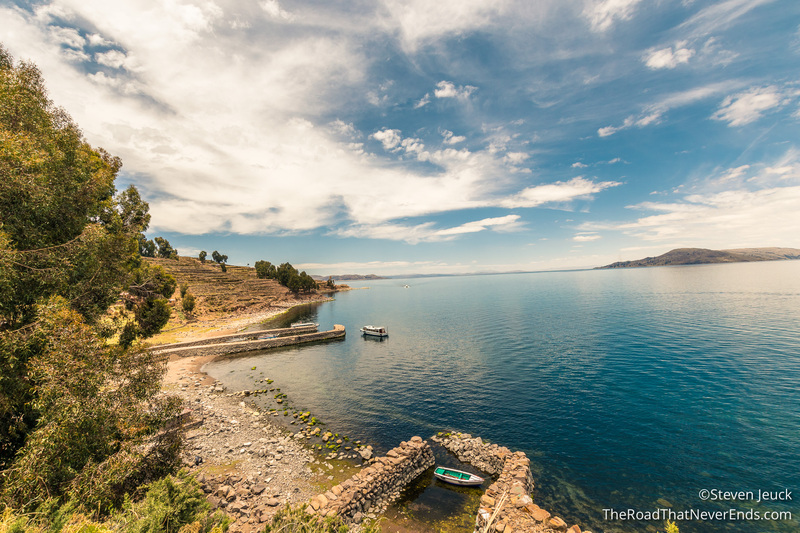 Lake Titicaca is the highest navigable lake in the world, and is shared between Perú and Bolivia. Steve and I only stayed for a few days, more so, as a break in the bus schedule. We stayed at Joya Andina Hostel. 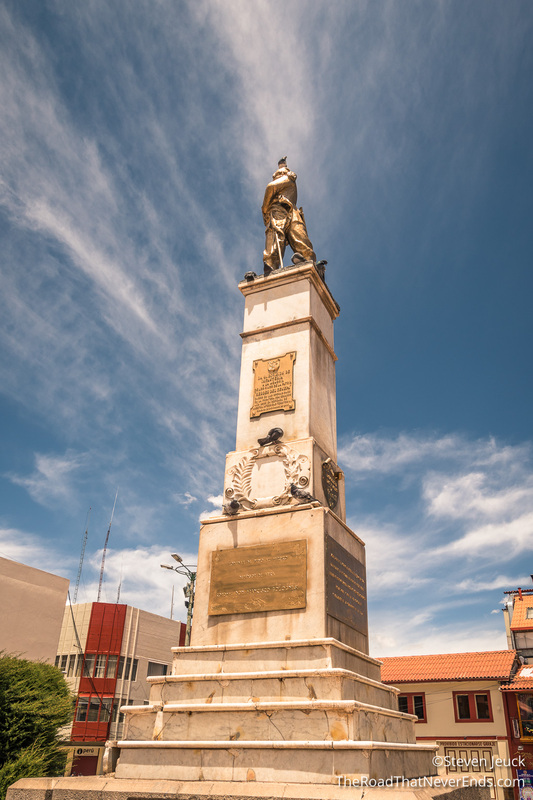 It was 3 blocks from Plaza de Armas, 15-minute walk to the lake, and 20-minute walk to the bus station. Overall, the location was perfect, breakfast was fantastic, bed was comfortable, and the Wifi worked well – no complaints. From Cusco, we stayed on night in the “industrial” area, close to the bus station. We left early the next morning for our 8AM bus ride to Puno. We had bought our bus ticket with the company Cruz Del Sur. Our “VIP” ticket was $22.00, and we were surprised how comfortable the ride was. The seats recline pretty well, had entertainment screens, and plenty of room. 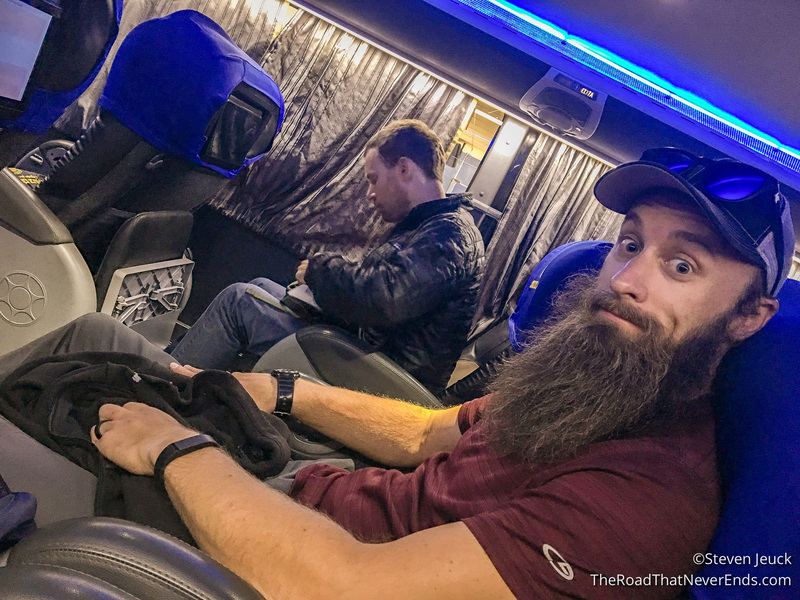 Our bus ride was scheduled for 6 hours, but it ended up being over 7 hours. 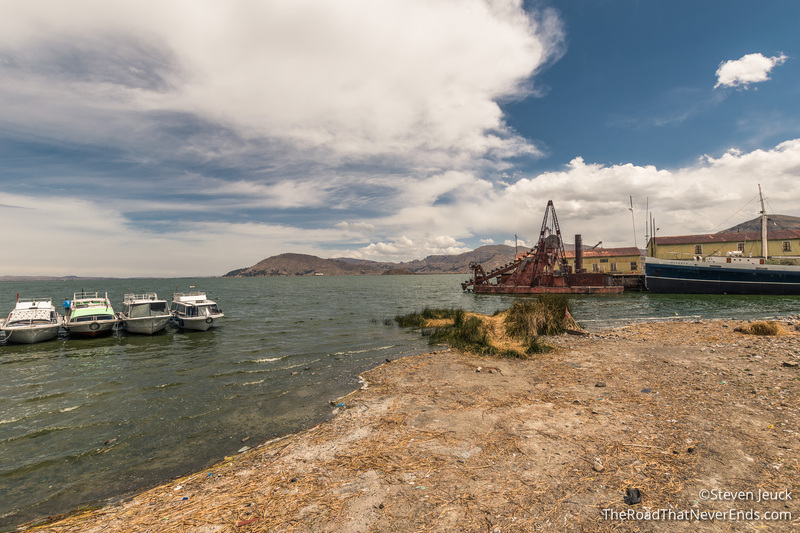 Once arriving in Puno, we walked about a mile to our hostel. 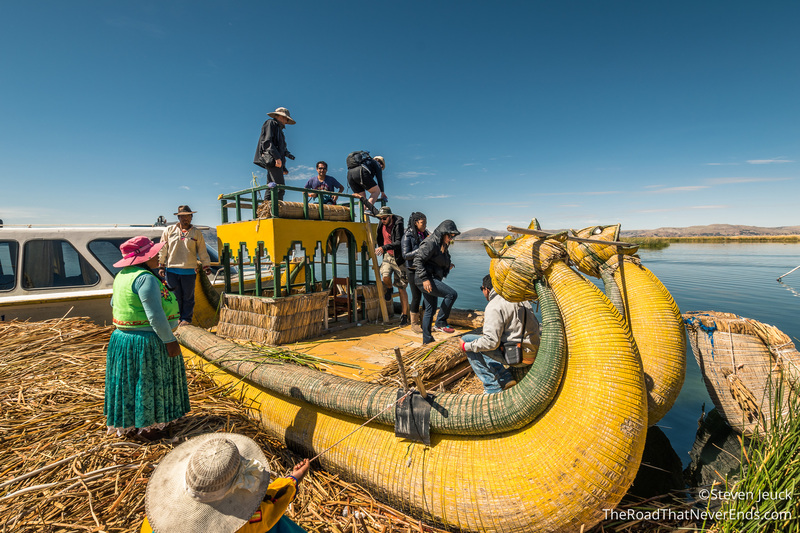 In Puno, we mostly walked around, although there is plenty of Taxis available. We treated ourselves to a more expensive dinner than we usually do, because we read such fantastic reviews on Mojsa Restaurant. I ordered the passion fruit trout (fish twice in a day – heavenly!). It was amazing. It was the first restaurant also that the service was like something you would see in America. We weren’t surprised to see that the Manager was an American from Minnesota. We enjoyed talking to her and she even gave us tips at other restaurants. Once we checked in to our hostel, we arranged to do a lake tour the next day. Setting up the arrangements at the hostel was by far a lot cheaper than anything we found online. 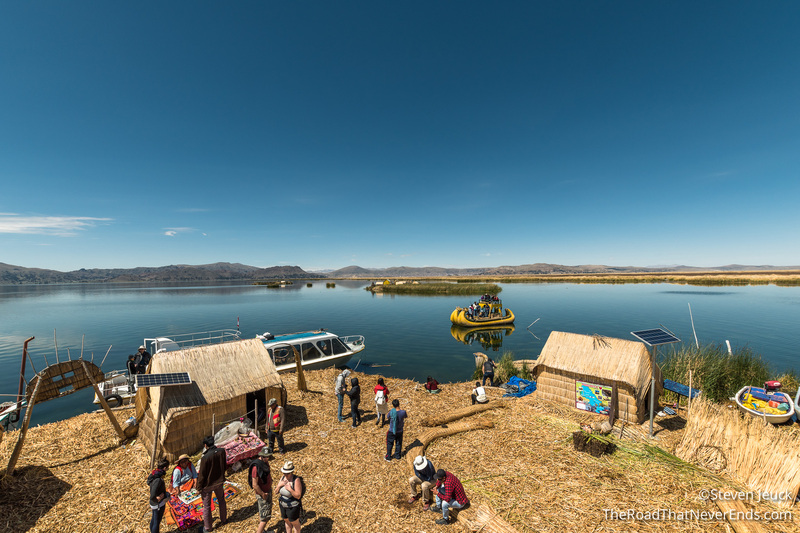 Uros Floating Islands – The Uro people live on 87 self-made floating islands in Lake Titicaca. Originally built for self-defense reasons, the island also serves its purpose to move where the fishing is good. Once the Inca conquered the area, most of the Uro people became slaves. Today, the Uro people still follow the same customs, but also accept technology & tourism. Each island has a President, who negotiates on behalf of the island. The islands get together for festivities, often moving their island next to each other for a night of singing, drinking and dancing. About 90% of the inhabitants are Catholic, and 10% are Protestant. Kids have to take boats to a nearby floating school, often taking up to 30 minutes to reach their school. 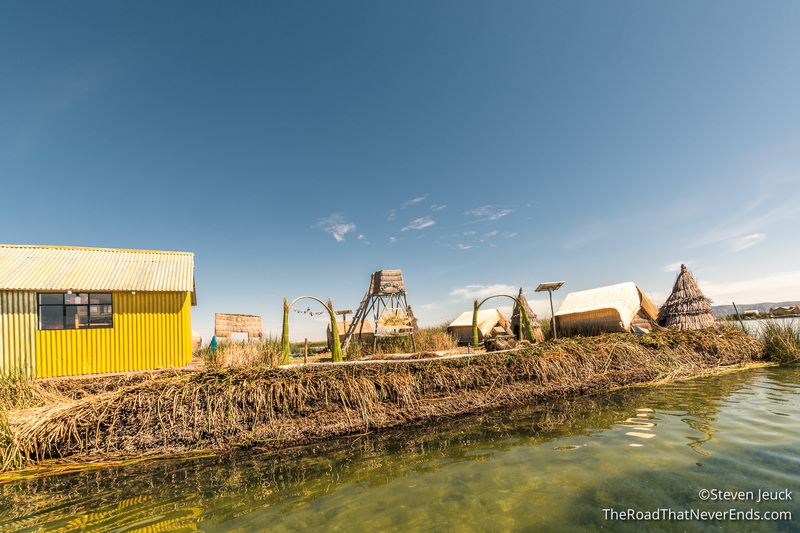 All of the islands are built on reeds, and last for 30-35 years. It really is fascinating. We took a tour of an island of 30 people, 6 families total. The President gave us a demonstration on how the island is made, what tools the family uses, and the leadership council of the islands. I was surprised to see solar panels on the islands. We got a tour of the school island from a reed boat. The wives also gave us a tour of their homes. Steve and I got picked to view the President’s home, by the first lady. The beds are made out of reeds, but covered in blankets and pillows. Four people live in the small home we saw, which blew our minds. After the tour they invite you to look at their market, all homemade goods and textiles. Our tour group spent about an hour here. 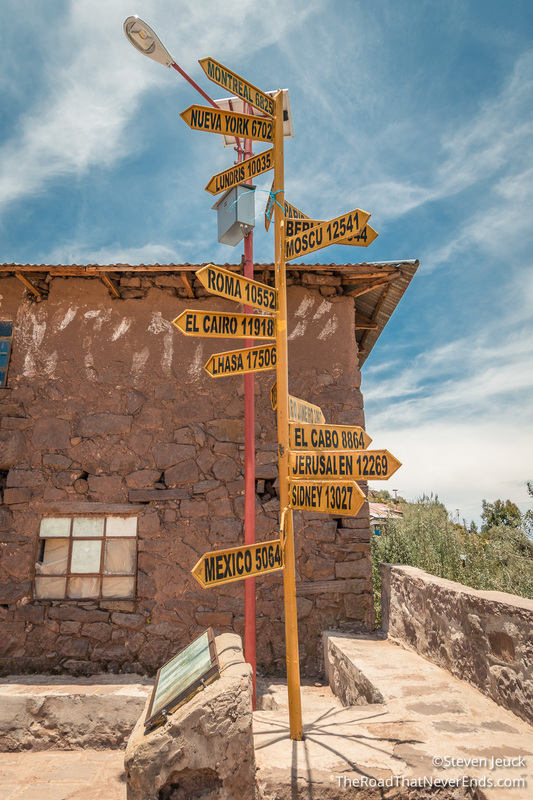 Taquile Island – A small but culturally rich island. We arrived at one port, and walked about 45 minutes into town. We reached the highest point on the island which is over 13,000 feet above sea level! 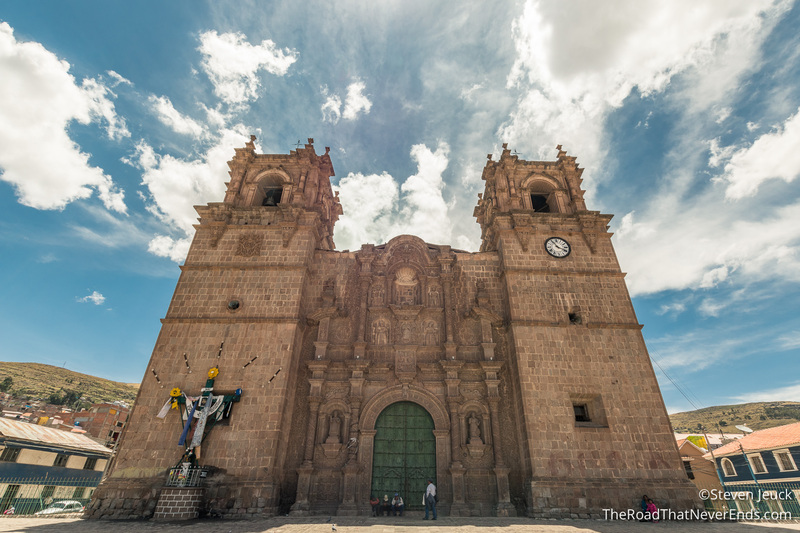 Once reaching the Plaza de Armas, we checked out the church and the textile stores. Taquile Island is known for the best textiles in Perú. I was surprised that men do all the knitting, and learn from an early age, while women do weaving. Everything was beautiful. There is a lot of customs here: Boys/Men that are single wear a red & white hat, while married ones wear a red hat. Women wear black veils with poms poms, and depending on the size and color of the pom pom, it will show they are married, single, and have children. 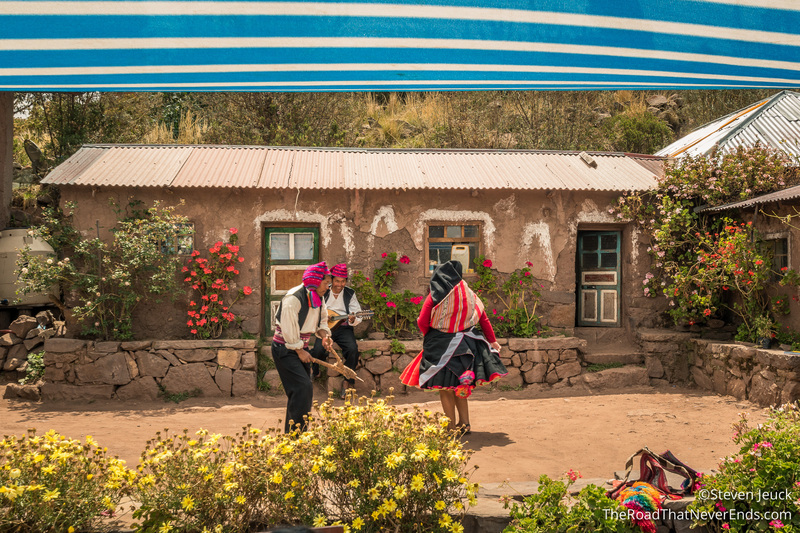 The residents of the island are mostly Catholic, but still honor their Inca traditions. They don’t oppose technology. The island has solar panels set up throughout the island, and we saw a young girl listening to music on her iPod. We were treated to lunch at a local home, where the family played music, did traditional dancing, and cooked a delicious meal – vegetable soup, trout, rice and mint tea. We stayed on the island for a few hours and really enjoyed our time here. We also had an opportunity to walk around the town and view historic buildings as well as the waterfront. We were disappointed we were not able to get a tour inside the main cathedral, but still took photos. It was beautiful.